I had previously written about the 25th year of Kwang Hsu Fengtien dollars, which is one of my favourite Chinese silver dollars. I would like to complete my previous article by introducing another interesting die variation, which brings the total to 4 main variations for this one year type coin. This is most likely the first variation produced. The style is very similar to the one of the previous year, and it is very well executed. However, die engraving is quite a technical art, and a small mistake can lead to damaged dies and coins defects. This particular variation was unfortunately afflicted with a die crack running through the 绪 character. 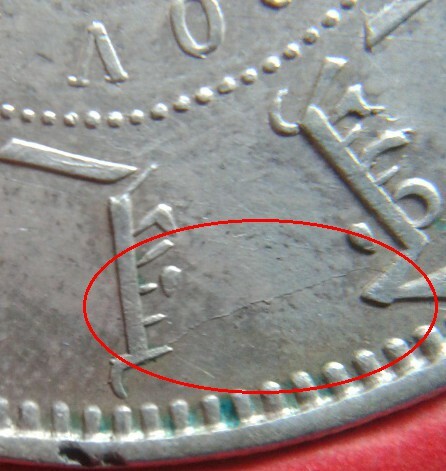 The severity of the die crack varies depending on the time the coin was struck, but it is always present on genuine coins. You will also notice that the swirl on the fireball is weakly struck. On the reverse, there is a problem with typography (bad spacing between F and U) and weak strike (on G -). This variation is a complete redesign of the previous one. It is likely that this pair of dies was made as soon as the defects of the previous one were known. Compared to its predecessor, it seems like a rushed job. The face of the dragon looks flat and crude compared to the first version. The spacing of the Chinese characters is unbalanced (局 and 造 are too close, 年 and 奉 as well), while the legend of the first version was evenly spaced. 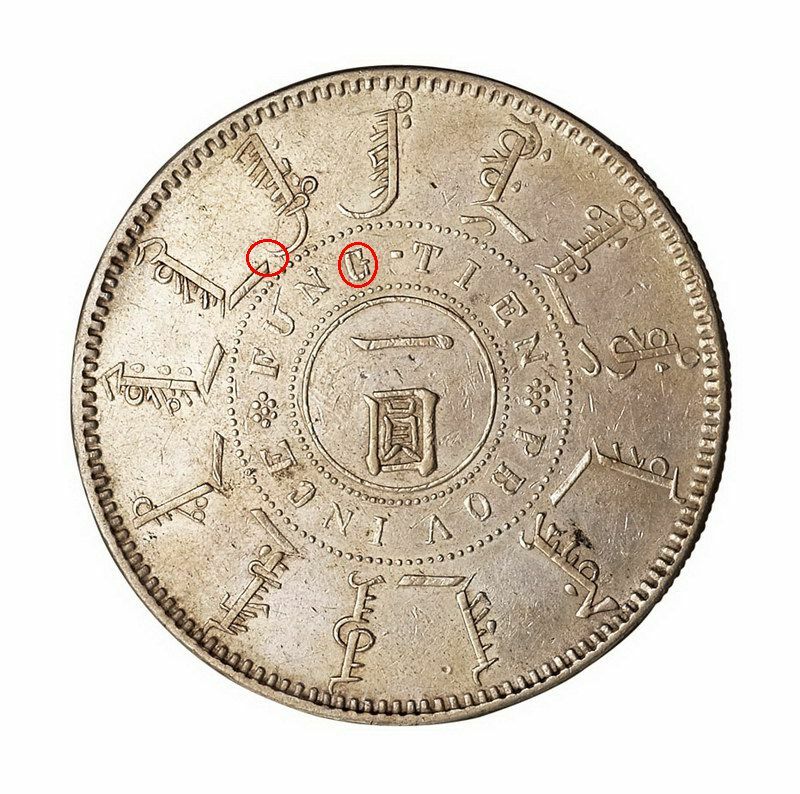 The reverse was improved though, the bad spacing in the English text was fixed and it is now clearly struck, however it was the turn of the pearl circle to suffer from weak strike. While overall the 25th year of Guang Xu Fengtien coins are rare, some variations are scarcer than others. The coins with a single circle of pearls are more common than the double circle variations. The first variation to present this double circle is actually an incremental revision of the 2nd variation. 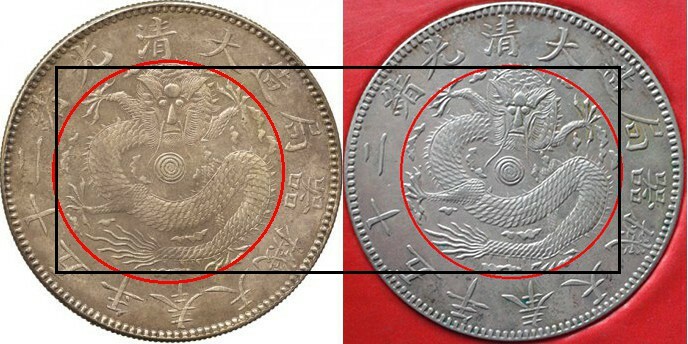 The obverse was reworked to correct the chinese characters spacing and slightly improve the dragon pattern, which remains cruder than the 1st design. This is the additional version that I want to introduce. It is in my opinion the most interesting variation for this coin. The reverse has been completely reworked, keeping the solid circle. The manchu script has been fixed, and the whole face is well struck. However, a die crack appeared at 5 o’clock. The dragon design has been updated as well, in the fine style of the 1st variation. 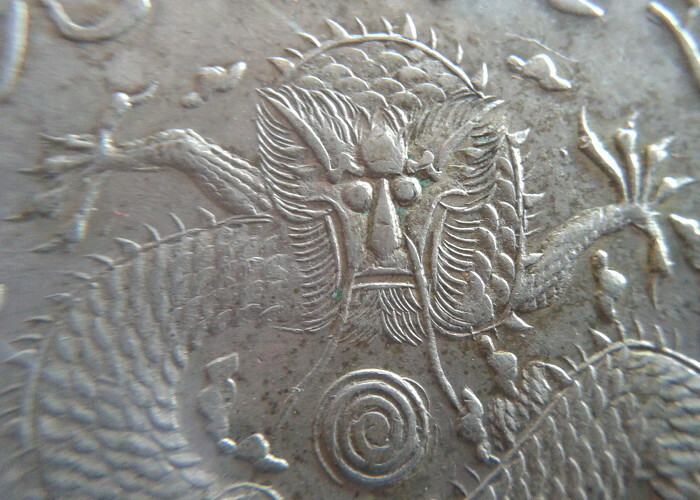 Its face is artfully designed, in the fashion of previous Fengtien coins, with the smiling dragon seemingly flying toward the high relief fireball. The dragon is much smaller than the one featured on the cruder variations, and the spacing of the Chinese legend has been improved as well, which makes this obverse much more balanced and good looking. I believe this variation was the last silver dollar minted at the Fengtien machine bureau before the short lived 1903 dollar, four years later. Indeed, this particular design is often seen with a huge die crack on the reverse, and late samples seem to have been struck with very worn out and damaged dies. This leads me to believe no more dies were made afterward and the last ones were used until they broke down, their degradation mirroring the one of the political situation in the Fungtien province.